A SPOKESPERSON for the Northern Ireland Fire Service said the emergency services were notified about the St John’s House fire in Downpatrick at 3.45pm on Sunday 14 October. Fire crews rushed to attend the two-storey derelict building but the ground and first floor were well alight on their arrival. Crews and two main jets were used to eventually extinguish the blaze several hours later. An investigation is ongoing into the cause of the fire. The incident was dealt with at 3.07am the following morning on Monday 15 October. PSNI remained at the scene. 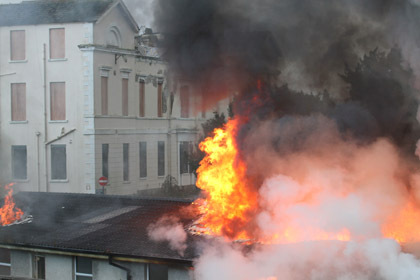 The scene as the fire raged at the former St John’s House residential home in Downpatrick. The large scale operation involved fire appliances being called in from around the area… two from from Downpatrick Fire Station, two from Ballynahinch Fire Station, one from Lisburn and a Command Support Unit, one from Knock Fire Station and an aerial ladder platform, one from Rathfriland Fire Station, one from Newcastle, one from Springfield Fire Station and the Fire Service Emergency Support Service (FESS). 11 applainces in total attended the blaze. However, an alarm was raised again at 9.57am today (15 October) at the Pound Lane fire site and a four appliances were in attendance from the Downpatrick, Ballynahinch, and Newcastle fire stations. Fire Crews were called to dampen down hot spots from a fire yesterday, but NIFRS were then made aware that there was confirmed asbestos in the building. Immediately NIFRS Hazmat Officer put up a 50m cordon around the fire site. The PSNI informed local residents within the 50m exclusion zone to stay indoors and close all doors and windows as a precautionary measure while background air quality monitoring was carried out. The assessment confirmed that air quality was safe and the exclusion zone was lifted. NIFRS handed the scene over the South Eastern Health and Social Care Trust at 2.54pm. The scene is one of utter devastation. The whole building is destroyed. A Trust spokesperson added: “Estates staff from South Eastern HSC Trust have inspected the St John’s house site this morning and are now waiting on clearance from structural experts so that a forensic examination of the fire scene could go ahead this afternoon. “Health estate buildings are disposed of through a process within the Department of Health and this was well advanced. Tenders for the demolition of the former residential home are due to be opened at 12 noon, and clearance work on site had also been due to begin today (Monday 15 October).